At 6:39 am EDT today, a spacecraft weighing over 2,000 kilograms (4,400 pounds) with a wingspan half that of a Boeing 747 crashed gently into a comet’s surface, following 13 hours of free-fall. These, my friends, are the last, fleeting glimpses of Comet 67P that Rosetta managed to capture before its instruments went dead. 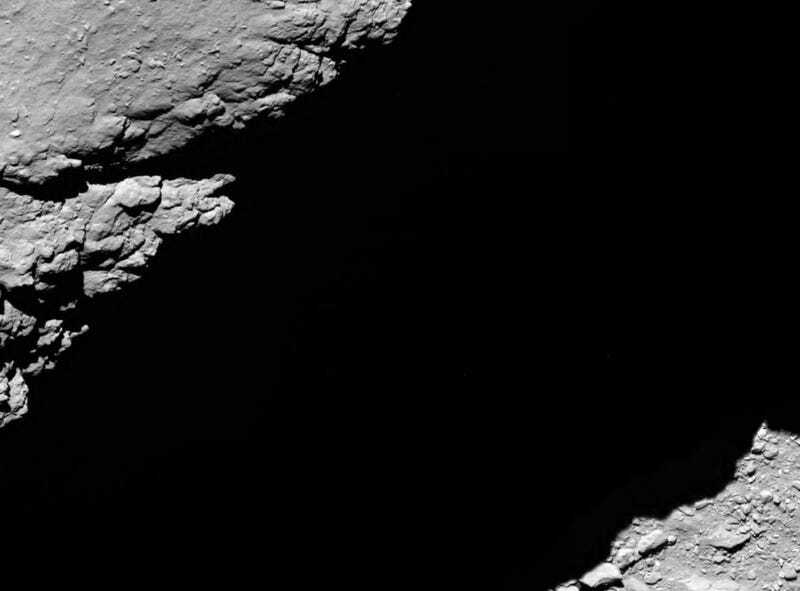 They’re also some of the best photos humans have ever taken of the surface of a comet, period. So enjoy them—because we won’t get another mission like this for a long time. Comet 67P from 1.2 km. The Rosetta spacecraft’s landing site, Ma’at, is stitched together here from a series of images. It was aiming for a a spot between the pits seen on the left and right. Comet 67P from 5.8 km. Comet 67P from 8.9 km. Comet 67P from 15.5 km, showing the entire ‘head’ region where Ma’at is located. Comet 67P from 19.4 km. Comet 67P from 20 km. On Rosetta’s blog this morning, the ESA also posted a series of screenshots showing the signal from the spacecraft fading into white noise at around 7:19 am EDT (it takes 40 minutes for communications to travel from Comet 67P to the Earth). No doubt, these images will come in handy when Rosetta truthers start insisting the comet landing was faked. Fare thee well, Rosetta. Your watch is over.